Your 2-year-old is growing and developing at a fast pace and needs toys that will support and stimulate their development. Play is the most important component in developing critical skills for toddlers and children. You should be choosing toys that allow your 2-year-old to play independently, as well as challenge themselves physically, cognitively and socially. These toys will keep them engaged and active in their play and learning. This selection of toys are great for supporting your child’s development intellectually, emotionally, socially, and physically. Play-Doh is one of the most versatile toys available for children of all ages. The possibilities for both independent and guided play are endless. Your toddler develops fine motor skills manipulating the clay and uses their imagination to build their creations. 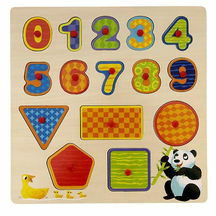 You can also guide their play by identifying colors, or creating shapes, numbers, and letters for them to identify. 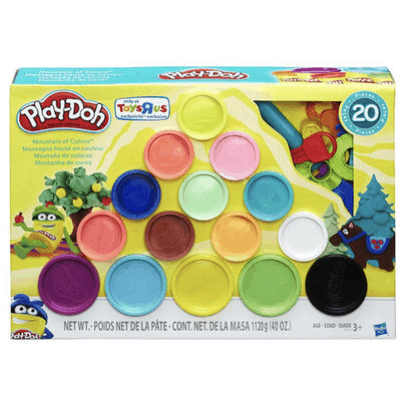 Play-doh is nontoxic and easy to clean up, so you and your 2-year-old can focus on enjoying play time. 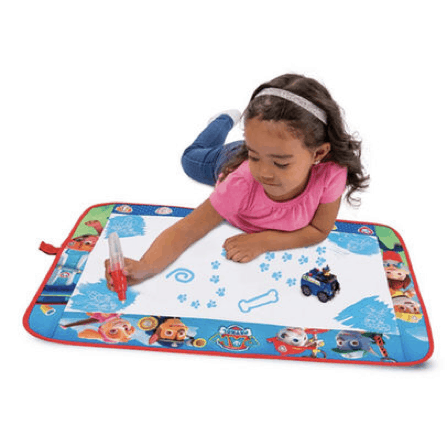 The Aquadoodle mat is another versatile toy that your 2-year-old can enjoy for years to come. Fill the pen with water and then mark on the mat to create pictures without worrying about making a mess or staining carpets, tables or any other surfaces in your home. Practicing holding the pen and creating lines and shapes strengthens your child’s fine motor skills as well as creates the foundation for writing letters and numbers. 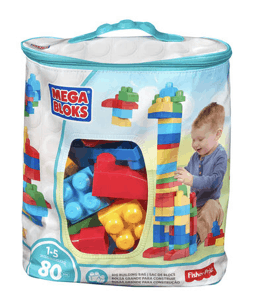 Mega Blocks are a favorite of toddlers and kids for the endless possibilities to create and learn about their world. Toddlers love to build towers and knock them over to discover and test the limits of our natural world as well as build their fine and gross motor skills. These blocks are large enough for 2-year-olds to be able to manipulate and light enough to be safe for them to explore with. This set comes with a carrying bag, which makes clean up and storage easy. 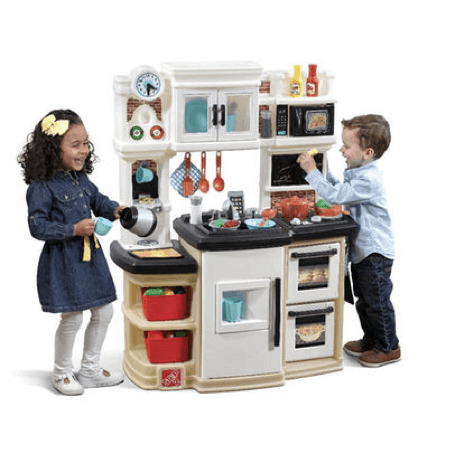 Toddlers love to imitate what they see and this play kitchen allows them to pretend they are cooking just like Mommy and Daddy. It includes realistic looking appliances, dishes, storage bins and a restaurant-style window. This is a great toy to encourage social development through cooperative play with other children. Opening appliance doors, carrying pots and pans, and using cooking utensils help develop gross motor skills as well. Additionally, naming and identifying all the kitchen items will expand your child’s vocabulary. 2-year-olds love to pretend play, especially with animals, so this farm playset will be a favorite. This is a great toy for both independent play and play with other children, especially as your toddler is learning to share. Manipulating the figures, placing them in the farmhouse, pressing the buttons and opening all the doors and gates develops their fine motor skills while learning the animal names and sounds is a fun way to build their vocabulary and knowledge of their world. As they pretend to take care of the animals, they are also building emotional development skills, learning how to show care and kindness. 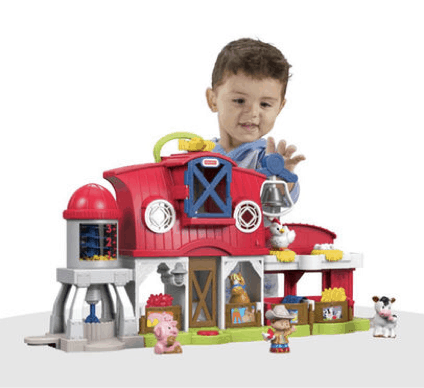 This play set includes a farmer, pig, cow, horse, and chicken figures, as well as the barn with stalls for each animal. This toy is one that can grow with your toddler. The Alphabet Activity Cube spans multiple developmental stages and areas, from a peg board and turning gears, shapes, and colors, to numbers and letters, this toy will keep your child interested for years. 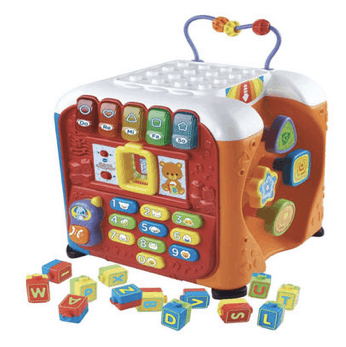 This toy includes doubled sided alphabet blocks, keypad and removable phone, turning gears, sliders, and beads, peg maze, building surface on the top of the cube, and alight up piano keyboard. There are 100+ songs, sound effects, and phrases that will keep them engaged for either independent or guided play. The blocks are stored inside the cube for easy storage. Kids love creating sound and music, and with these high-quality instruments, they can create a large variety of sounds using each instrument. 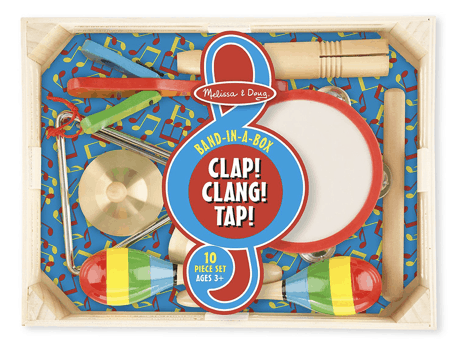 The set includes a tambourine, cymbals, maracas, tone blocks, clacker, and a triangle, as well as a sturdy storage box. They are well made and durable for long use and loud enough to keep your child interested and engaged, but not too loud that adults are bothered. 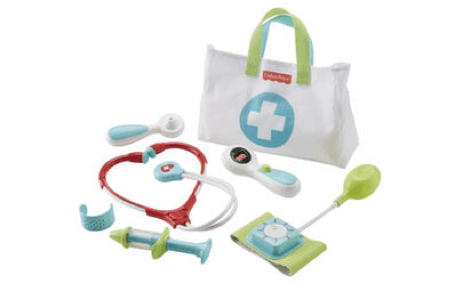 Your 2-year-old will love to pretend play with this doctor’s kit and will build social and emotional skills by pretending to take care of their friends and family, as well as explore what to expect when it comes time to see a doctor. This set includes a toy stethoscope, thermometer, otoscope (for looking in ears), blood pressure cuff, syringe, bandage, and doctors bag. 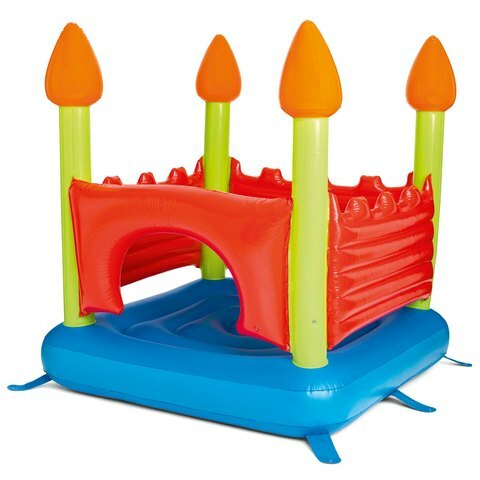 This inflatable bouncy castle is a great way for your 2-year-old to develop their gross motor skills and have a ton of fun at the same time. It is small enough to fit inside or to set up outside for hours of fun. In order to develop their gross motor skills, children have to push their limits and this toy allows them to explore safely and securely. Your 2-year-old will feel successful and enjoy learning as they master this numbers and shapes puzzle. The pieces are big enough for them to manipulate and place in the correct spaces while still remaining challenging enough to hold their attention. As they play with this puzzle more, they will become more independent with identifying the numbers and shapes.